^ 2.0 2.1 2.2 Peter J. Riggs. Quantum Causality: Conceptual Issues in the Causal Theory of Quantum Mechanics. Springer Science & Business Media. 5 June 2009. ISBN 978-90-481-2403-9. ^ Kenneth S. Krane. Introductory Nuclear Physics. Wiley. 5 November 1987. ISBN 978-0-471-80553-3. ^ Langmuir, Irving. The Arrangement of Electrons in Atoms and Molecules (PDF). Journal of the American Chemical Society. 1919, 41 (6): 868–934 [2008-09-01]. doi:10.1021/ja02227a002. （原始内容 (PDF)存档于2012-03-30）. ^ 9.0 9.1 The Sodium Doublet, The Sodium Zeeman Effect. Hyperphysics. Georgia State University. ^ G. ARULDHAS. MOLECULAR STRUCTURE AND SPECTROSCOPY. PHI Learning Pvt. Ltd. 9 June 2007. ISBN 978-81-203-3215-7. ^ 11.0 11.1 Pauli, Wolfgang. Exclusion Principle and quantum mechanics. Nobel Lecture. Nobel Foundation 1945. ^ 12.0 12.1 12.2 12.3 12.4 Straumann, Norbert. The Role of the Exclusion Principle for Atoms to Stars: A Historical Account. Invited talk at the 12th Workshop on Nuclear Astrophysics. 2004. ^ Stoner, Edmund. The Distribution of Electrons among Atomic Levels. Philosophical Magazine. 1924, 48: 710–736. ^ S.A. Goudsmit. The discovery of the electron spin. [2009-08-27] （英语）. ^ Charles P. Enz. 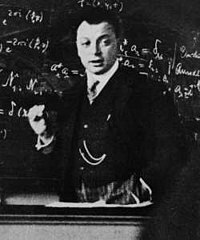 No Time to be Brief: A Scientific Biography of Wolfgang Pauli. Oxford University Press. ISBN 978-0-19-958815-2. ^ Ian Duck and E. C. G. Sudarshan. Pauli and the Spin-statistics Theorem. World Scientific. 1997. ISBN 978-981-02-3114-9. ^ 18.0 18.1 Neuenschwander, Dwight. The Spin-Statistics Theorem and Identical Particle Distribution Functions (PDF). Radiations. Fall 2013: 27–32 [Nov 10, 2014]. ^ Lieb, Elliott. The Stability of Matter:From Atoms to Stars : Selecta of Elliott H. Lieb 4. Springer. 2005. ISBN 9783540270560. ^ Dyson, Freeman; Lenard, A. Stability of Matter. I. J. Math. Phys. 1967, 8: 423. doi:10.1063/1.1705209. ^ Lenard, A.; Dyson, Freeman. Stability of Matter. II. J. Math. Phys. 1968, 9: 698. doi:10.1063/1.1664631. ^ 23.0 23.1 Dyson, Freeman. Ground‐State Energy of a Finite System of Charged Particles. J. Math. Phys. 1967, 8 (8): 1538–1545. doi:10.1063/1.1705389. ^ 24.0 24.1 Lieb, Elliot. THE STABILITY OF MATTER:FROM ATOMS TO STARS (PDF). BULLETIN (New Series) OF THE AMERICAN MATHEMATICAL SOCIETY. 1990, 22 (1). ^ Martin Bojowald. The Universe: A View from Classical and Quantum Gravity. John Wiley & Sons. 2012-11-05. ISBN 978-3-527-66769-7. ^ How does a black hole's singularity not violate the Pauli exclusion principle?. Quora. [2018-07-09]. ^ Raymond Serway; John Jewett. Physics for Scientists and Engineers. Cengage Learning. 19 December 2012. ISBN 1-285-62958-2. This page is based on the Wikipedia article 泡利不相容原理; it is used under the Creative Commons Attribution-ShareAlike 3.0 Unported License (CC-BY-SA). You may redistribute it, verbatim or modified, providing that you comply with the terms of the CC-BY-SA.